For more information from the state of Connecticut, click the banner below for EVConnecticut. Have Your Electric Car Charging Station Installed by a Qualified, Licensed Electrician. 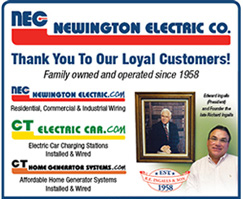 Connecticut Electric Car has the experience and know how to install the car charging station that’s right for your residential or commercial application at a price you can afford.